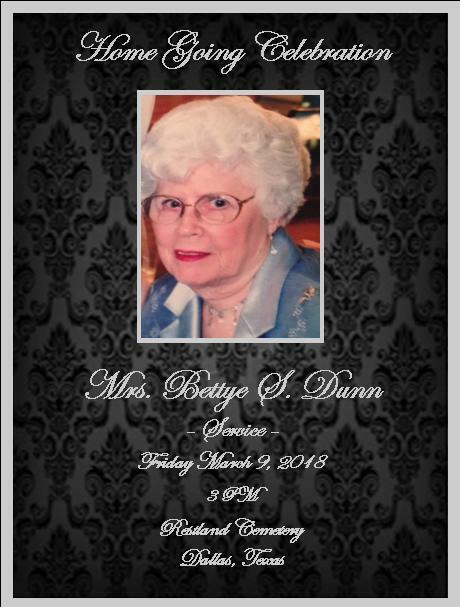 On February 13, 2018, Bettye Sara McKnight Dunn passed away at age 94. She was born in Arlington, Texas in 1923 and graduated from Arlington High School in 1940. She earned her college degree from Arlington A&M. Bettye and her husband, Bill, lived in Dallas their entire married life. Bettye had a professional career long before many women. She was the secretary to the president of Ling Temco, Clyde Sheen, for many years. She was a mother to three children, grandmother to three, and great-grandmother to six. She had many friends throughout work, volunteering, church and neighbors. She will be missed by all.